The Republican plans would stimulate the economy but at a cost of huge increases in the national debt, even using dynamic scoring to take into account the growth effects of these plans. Raising the top tax rate to 50%, a Democratic idea, would bring in $100 billion per year, but this is not enough to either make a big dent on budget deficits or lower income inequality appreciably. 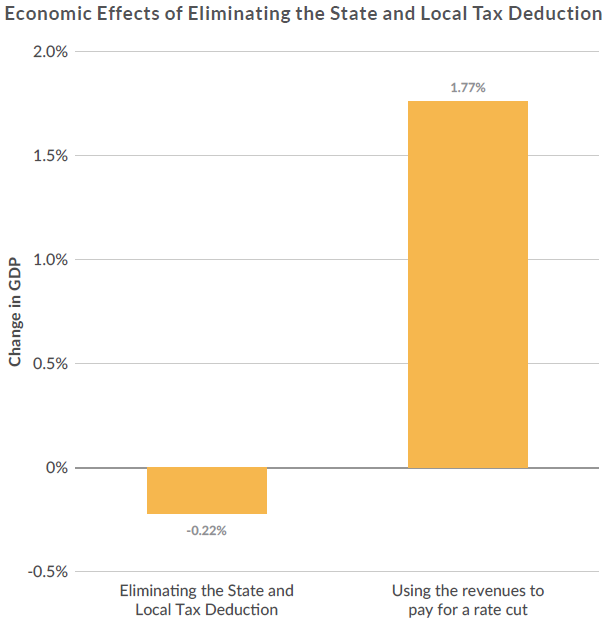 Eliminating the deduction for state and local taxes would raise $81 billion per year. Using this revenue to reduce individual income tax rates would grow the economy by 1.77% of GDP over 10 years. 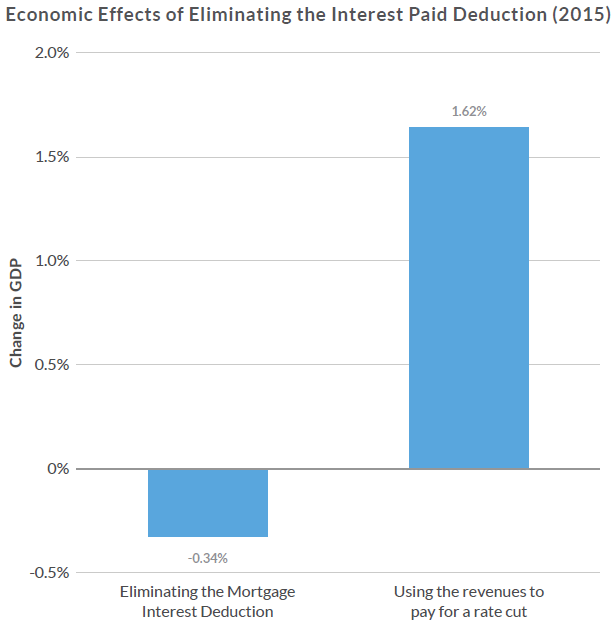 Eliminating the mortgage interest deduction would raise $75 billion per year. Reducing individual tax rates by the same amount would grow the economy by 1.61% of GDP over 10 years. 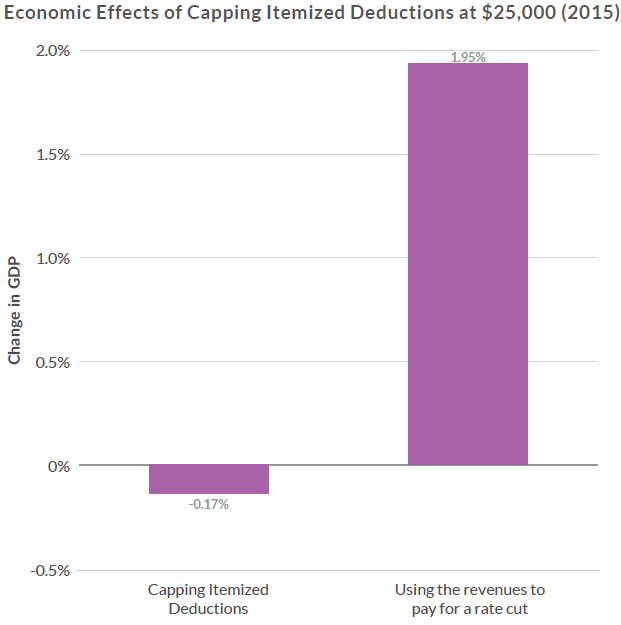 Capping itemized deductions at $25,000 would bring in $188 billion per year. Reducing individual tax rates by the same amount would grow the economy by 1.99% over ten years. Sensible, i.e. revenue neural, tax reform will do wonders for the economy as this study from the Tax Foundation shows. It will bring in more tax revenue to help pay the bills. It will raise salaries for the already employed. It will create new jobs for the millions of unemployed and underemployed people who want them. It will thus reduce income inequality by increasing the wages of people on the bottom. Why is this so hard for so many people to understand? This entry was posted in economic growth, economic inequality, Jack Heidel, Tax Foundation, tax rate cut, tax reform, tax revenue, taxing the wealthy and tagged debt, deficit, economic growth, Economic inequality, jack heidel, Tax Foundation, tax reform by jackheidel. Bookmark the permalink. The chart gives the actual percentages of income paid for each bracket, which takes into account all types of income. If our corporate rate were more competitive, then our companies wouldn’t be as interested in moving overseas. The simplest thing to do would be to eliminate all business and corporate taxes and tax all income, including capital gains and dividends, at the same rate. There is an example right now of a state gov’t doing what the GOP wants Cutting taxes for corporations and implementing taxes for the poor Look at “Kansas” It is trickle down economics on steroids If you are going to decrease debt it would be a good idea to increase revenue so there is something available to pay down debt I don’t come home and tell my wife I am going to pay off my bills by quitting my job I may have to make a investment up front to generate additional income but that means I will have to work more but hopefully smarter This idea that the debt is killing us so I am going to reduce taxes has proven to be a fallacy If we invest in infrastructure that creates more jobs and more tax revenue than we would all win Since we are historic low tax rates for corporations without the results, now is the time to increase those taxes and eliminate the “corporate welfare” and loopholes Eliminating the mortgage interest deduction is another example of taxing the poor. You are misinterpreting my remarks. I do not want to cut tax revenue. I agree with you that we need it to pay our bills. And this is exactly what is wrong with most of the Republican (presidential) plans, i.e. they lose revenue. I want to cut rates in order to stimulate the economy but always by paying for it by closing loopholes and shrinking deductions. Eliminating the mortgage interest deduction would not hurt the poor. 64% of all taxpayers, i.e. the poor and most of the middle class, do not itemize deductions and therefore would lose nothing by cutting back on deductions. What I am suggesting will increase taxes for the well-to-do and stimulate the economy at the same time. I’m going to leave your grammar alone on this one as you’ve now convinced me we need to spend more on education. However, Kansas is just a poorly designed example of supply side economics. Carving out a whole class of income exempt from taxes creates a massive incentive to turn ones income into that form. 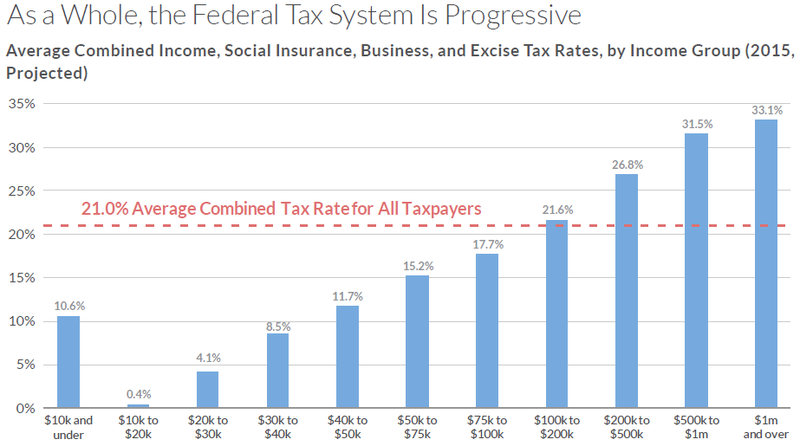 A better example is FL and TX, which exempt all income from taxes and thus reap the continuing benefits. I agree with you about Kansas, but this is not relevant to national tax policy. States have to balance their budgets. If they cut tax revenue, then they’ll have to cut spending as well. If this is what the people of Kansas want, fine.